Its atomic number is 79. Along with seven other metals clustered around it on the periodic table, it is one of the noble metals. Noble metals are metals that, unlike most base metals, are resistant to corrosion and oxidation in moist air. Nobel metals tend to be precious, often due to their rarity in the Earth's crust. The other noble metals (in order of increasing atomic number), are ruthenium, rhodium, palladium, silver, osmium, iridium and platinum. This amazing yellow metal is the most ductile (stretchable) and malleable (flattenable, for lack of a better word) of all metals. One ounce of it can be beaten into a thin sheet measuring 300 square feet. Because it is very soft, so it is usually alloyed with other metals to make it stronger and more durable. 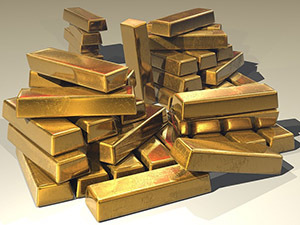 The high density of gold is another of its unique characteristics. It is 19.3 times more dense than water; that is, a square inch of gold weighs as much as 19.3 square inches of water. The gold bars held in Federal Reserve Banks measure 7 x 3.625 x 1.75 inches. (It’s about the size of gold bars you’ve seen thieves casually lugging around in the movies.) How heavy would one of those little bars be? About 30 pounds, so it would take a pretty Herculean thief to jump onto a freight train with a bag of them flung over his shoulder. 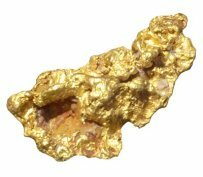 Gold is also extremely rare, and it can only be found naturally, not manufactured. It's average concentration in the Earth's crust is 0.005 parts per million. To put that figure into perspective, compare it to iron, which accounts for an average of 5.8% of the content of the Earth's crust (or 5.8 parts per one hundred). Speaking to both its rarity and density, experts have estimated that all the gold in the world, if refined to absolute purity, could be placed in a single cube measuring 60 feet per side. Gold is resistant to corrosion through oxidation or moisture. It also resists attacks by individual acids, but it can be dissolved by the aqua regia (nitro-hydrochloric acid), so named (aqua regia meaning “royal water” in Latin) because it can dissolve gold and platinum, the so-called royal or noble metals.